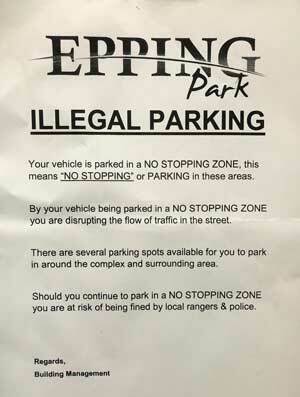 You are here: Home / Parking / Parking NSW / NSW Case Study: Is your illegal parking notice just an empty threat? This article about strata parking and issuing illegal parking notices has been supplied by Sophia Jiang, Omega Legal. Julia lives in a complex that is occupied by more than 200 residents and for many of them, finding parking in the complex is an everyday challenge. The building management has issued numerous enforcement notices to car users but the notices have not made much difference. In fact, the notices are tossed carelessly on the sidewalk of Julia’s building. Below is a recent example of an enforcement notice that warns car users who park illegally that they may be fined by local rangers and the police. While Julia does not condone illegal parking, she also questions whether the local council or even the police has jurisdiction to patrol the common property of a strata and community scheme and issue parking fines as threatened on the illegal parking notice. The answer is not a simple no as it depends on whether there is a parking area agreement that gives the local council the power to patrol and issue fines on private property. Since November 2016, the Strata Schemes Management Act 2015 (the Act) allows strata and community schemes to approach their local council to seek the council’s approval to enter into a parking area agreement. Under sections 650A (6) and (7) of the Act, the council may erect signs on private property, patrol and issue a penalty notice to any car users who act contrary to those signs. 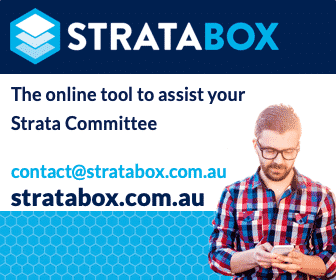 What is the process and how much does it cost to set up a strata and community scheme parking area agreement? The process requires first seeking the council’s approval, including providing documents such as parking plans and evidence of the majority of vote of the owners corporation or community association to make an application to the council for a parking area agreement. If the council approves the application, then a by-law will need to be passed by a special resolution of the owners corporation or community association (with no less than 25 per cent voting against the motion), as required by sections 650A(9) and 650A(10) of the Act. The costs are calculated by the council based on a service type arrangement and may include the costs for the installation and maintenance of signs required by the parking area agreement. Note that any revenue from the payment of penalty notices will be returned to the council, not the owners corporation or community association. So, is it worth it? The power for local council to issue penalty notices immediately is a strong deterrent for anyone who is tempted to ignore parking restrictions in your strata or community scheme. The costs and convenience for the arrangement with the council may even be more attractive than the owners corporation taking actions directly in the NSW Civil & Administrative Tribunal. If you have the majority of the owners corporation or community association in favour to approaching the local council, then it is worth taking the first step to speak with your local council as they may not approve your application. Is your illegal parking enforcement notice doing more harm than good? The last thing you want for your enforcement notice is for the recipient to use it against its issuer in court. The enforcement notice in this case study is a reminder to building managers and strata managers to check the validity of the scheme’s illegal parking enforcement notices before issuing them. In Julia’s case study, a quick call to the local council by a discerning resident revealed that there is no parking area agreement that gives the council the power to patrol and issue parking fines on the scheme’s common property. Consequently, the illegal parking enforcement notice is nothing more than an empty threat and undermines the credibility of the owners corporation. It can even be argued by a recipient of such notice that it is misleading, therefore exposing the building management, strata managers or even the owners corporation to civil liabilities. Is it then worth issuing an enforcement notice without first doing your research? If you are interested in finding out the steps, costs and outcomes for setting up a parking area agreement, see the NSW Office of the Local Government factsheet for strata and community schemes. Visit Strata Parking OR NSW Strata Legislation. It would be helpful to hear people’s experiences with obtaining a parking area agreement. While depending on the council one is approaching, perhaps some may be more motivated to patrol a strata complex if they will be ‘tipped off’ by building management beforehand to make their trip worthwhile. For instance, if a strata complex is located near a major train station where there are rangers who patrol the free parking areas around the station everyday, it would only take them a few minutes to extend their patrol to the strata complex. Maybe this could be helpful when pitching to the council. Thank you sharing your approach – we agree that having an illegally parked car towed would be perceived as a warning that carries more weight and inconvenience than the issue of any fines. Though for a car to be legally towed under reg 34 of the SSMR 2016, the minimum 5 day notice period must have passed. Practically, a car is only ever illegally parked for no more than 24-48 hours and often by repeat offenders and the lack of the immediate response for each offence can be a long term headache for strata managers. Of course it is both an empty threat and an illegal notice that does not meet with SSMA requirements. Wen first photograph offenders over a period of time, then if we can determine it is a lot owners vehicle we resolve on and issue a Notice to Comply, with an NCAT action if not complied with. If it is not a known lot owners vehicle they get two notices seven days apart, advising parking is illegal and towing is possible. At 14 days they are towed the local Police are advised to ensure that their time is not wasted on Stolen Vehicle reports. If the vehicle appears on the site again illegally parked then it is subject to an immediate tow as it is deemed as having a Permanent Towing Order. Parking has improved since adopting this approach. I don’t know about anybody else but in my experience with multiple councils, none of them want anything to do with helping police the parking in strata buildings. not one council was interested in even discussing it.